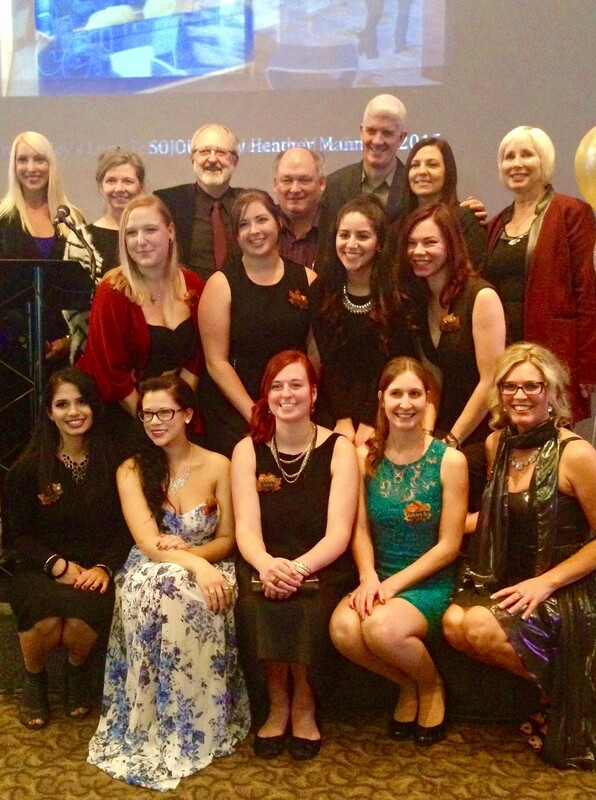 The first cohort of students to complete Conestoga’s Bachelor of Interior Design program celebrated their achievement with friends, family and industry stakeholders at a Graduation Gala held at the Tannery in Kitchener’s warehouse district on October 29. This inaugural class - a group of 10 women that started the program in September 2011 - organized and financed the event on their own. Conestoga's first Bachelor of Interior Design class will graduate at the 2015 Fall Convocation. Students celebrated their achievement at a Graduation Gala on October 29, 2015. During her remarks Dr. Julia Biedermann, executive dean of Conestoga’s School of Engineering and Information Technology, described the group of graduates as “trailblazers and champions” who always thought about how the program could be improved for those that followed. She will join the students at Conestoga’s Fall Convocation on Saturday, October 31, 2015 to formally mark their graduation. Conestoga president Dr. John Tibbits also attended and congratulated the graduating class on its achievement and success, noting even more women are needed in STEM (science, technology, engineering and mathematics) programs. The gala celebrated student achievement, showcased capstone projects and provided networking opportunities. Guests in attendance also heard from industry leaders. Karen Wilson, of Karen Wilson Interior Designs Inc. and a member of the Association of Registered Interior Designers of Ontario (ARIDO), aptly described the students as “pioneers of the program”. She shared background on the industry association and the steps needed to become registered in the province as an interior designer. Keynote speaker Annie Bergeron, design director at global design firm Gensler, shared her background - both her motivation for joining the industry and a snapshot of the positions she’s held throughout her career - and provided students with lessons she’s learned over the years. She spoke about the value of mentorships, keeping up credentials and the benefits of staying connected to your alma mater. Awards were also presented to: Lara Choujaa, Academic Proficiency in 2014-2015; Jasmine Dosanj, Interior Design Studio VIII year 2014-2015; and Heather Manning, Excellence in Design and Professional Promise. The other graduates include: Valerie Cochrane, Bronwyn Greavette, Julia Hamann-Shea, Ashely Heath, Sydney Murawsky and Emily Voisin. Conestoga’s Bachelor of Interior Design co-op program focuses on architecture and interior design and relies heavily upon project-based learning. The program was designed in consultation with ARIDO and is on its list of recognized interior design programs.